Place chicken and marinade in a shallow dish; mix until well coated. Marinate no more than 1 hour. 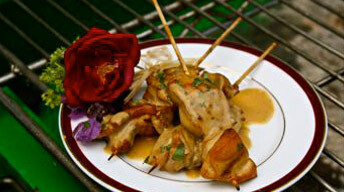 Remove chicken from the marinade and skewer on wooden or metal skewers; bake or grill until done. Sprinkle with fresh chopped thyme and a squeeze of fresh lemon juice before serving. Serve with rice or roasted garlic mashed potatoes. Combine all the ingredients in a bowl and whisk until well mixed.